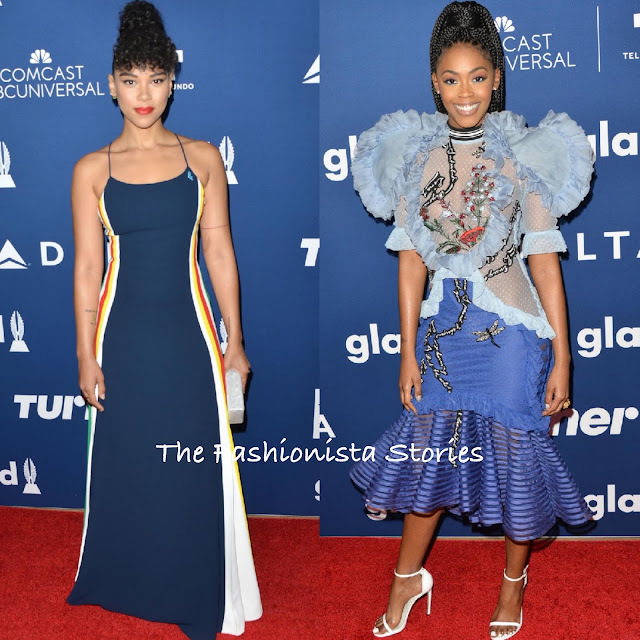 Yesterday afternoon(April 11th) Alexandra Shipp and Nafessa Williams hit the red carpet at the 29th Annual GLAAD Media Awards 'Rising Star' luncheon at The Beverly Hilton in Beverly Hills, CA. 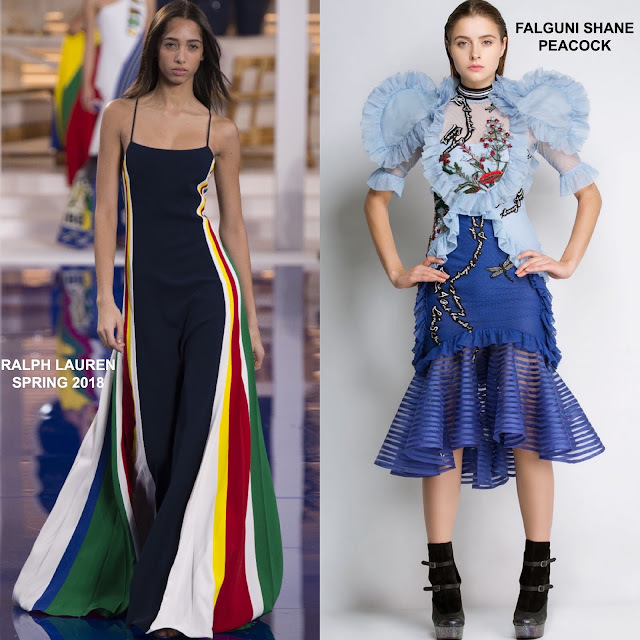 Alexandra Shipp looked pretty in a RALPH LAUREN SPRING 2018 navy maxi dress with spaghetti straps and contrasting white, red, yellow, green & cobalt blue side stripes. The side stripes is what breathes life into this maxi dress but the fit & simplicity styling by Alexandra's keeps it the focal point as it should. A curly up-do, red lips and a box clutch finished up her look. Nafessa Williams is a fashion risk taker so it is no surprise that she is wearing this fussy, detailed FALGUNI SHANE PEACOCK dress. Her powder & royal blue semi-sheer dress featured trumpet panels, floral embroidery and ruffle tulle & organza panels. She ensure nothing else competes with her dress, she wore her beautiful braids in a half-up half-down off-the-shoulder hair style. STUART WEITZMAN sandals finished up her look.